Rollins School of Public Health is the third largest school at Emory University in student enrollment and second largest in funded research. 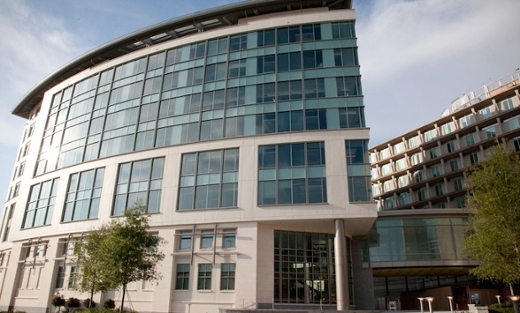 The Emory Rollins School of Public Health received a No. 5 ranking among the nation’s 177 accredited programs and schools of public health in U.S. News & World Report's 2020 edition of Best Graduate Schools. Rollins has placed in the top 10 for more than 15 years—most recently, as No. 7. This year marks the first time that accredited programs of public health were included in the list. Rollins has a long-standing tradition of excellence both in and outside of the classroom. Established as a graduate program in 1975 and as a school in 1990, Rollins is now the third largest school at Emory University in student enrollment. To help accommodate its growth, the school recently received a $65 million gift from the O. Wayne Rollins Foundation to support the construction of a third building. The school is currently ranked sixth in National Institutes of Health funding and supports 22 interdisciplinary centers. Home to six academic departments and an Executive MPH program for working professionals, students can earn master’s degrees, doctoral degrees, dual degrees, and/or certificates while simultaneously gaining real-world experience through applied practice experiences, global field experiences, or the school’s signature Rollins Earn and Learn program. The U.S. News & World Report’s public health school and program rankings are conducted every three years and are based solely on the results of peer assessment surveys sent to deans, faculty, and/or administrators of the nation’s Council on Education for Public Health-accredited programs and schools of public health. Rollins is tied fifth with the University of Michigan School of Public Health.